The meeting was called to order by Deputy Mayor McConnell at 7:00pm. Mayor Hall was excused for personal reasons. The Deputy Mayor proclaimed April 7 to April 13, 2019, as Volunteer Week in the city of Shoreline. On behalf of all volunteers, Robin McClelland from the Richmond Highlands neighborhood accepted the Proclamation. McClellan was a member of the Sidewalk Advisory Committee and was instrumental in the creation of the Richmond Highlands mural recently installed on the north side of Spiro’s at 185th and Aurora. Deputy Mayor McConnell then recognized Cindy Dittbrenner and Katie Schielke, outgoing members of Parks, Recreation, Cultural Services and Tree Board whose terms have expired, and Betsy Robertson who was appointed to the City Council and submitted her resignation from the Board in January 2019. Last Friday was the Ribbon Cutting to celebrate the completion of the sidewalk connecting the Interurban Trail to Echo Lake Elementary and the North 195th St Trail. Last Saturday was the first Shoreline Walk of the season. This one was 3 miles through the Westminster Triangle area. There are 18 more walks scheduled. No need to sign up. Check online for schedule. On March 30th, Mayor Hall and city staff met with Forterra in kicking off the Green Shoreline Partnership. Forterra works in partnership with local municipalities to develop long-term plans and community-based stewardship programs to care for the valuable forests and natural areas in our urban environments. 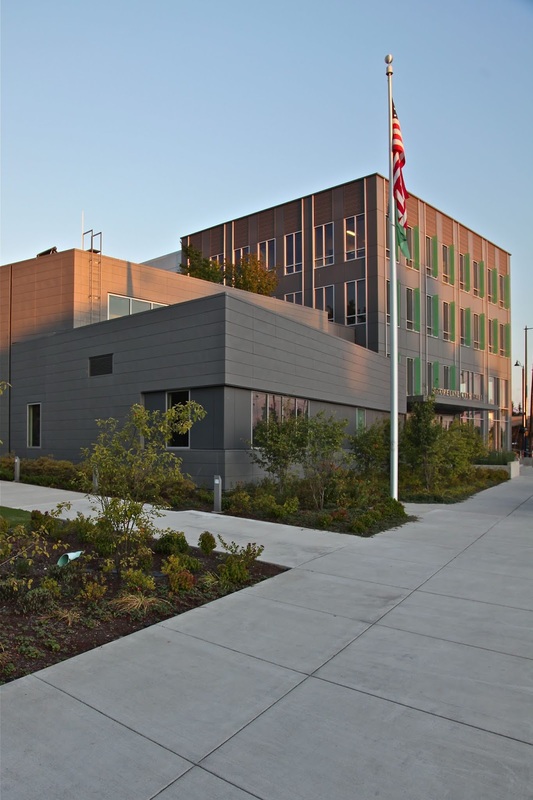 Catholic Housing Services and Community Psychiatric Clinic will provide an update to the 198th and Aurora planned affordable housing at an Open House 4/10 at Shoreline City Hall room 301 from 6:30 to 8:30pm. The Shoreline Social Justice Book Club will meet 4/14 from 2:00 to 4:00pm in City Hall Council Chamber. This month’s book is Normadland: Surviving America in the 21st Century by Jessica Bruder. Park Volunteer Work Parties meet Saturdays and Sundays in April. Check online for times and locations. Councilmember Scully attended a 5 hour meeting of the Continuum of Care Board and listened to impassioned stories of what we do wrong in addressing homelessness. It is clear there is a need for a central authority. In September Regional Action Plan for the Central Authority will be rolled out. Pending final details, it appears it will include King County, Seattle, and others who sign on to it, and will determine policies and how money is spent on them. Deputy Mayor McConnell attended the Seashore Transportation Forum. Community Transit gave a report. Contact them if you see a problem in coordinating a trip. The Agenda was adopted and the Consent Calendar approved unanimously. Bill Franklin be appointed for a second term, Bruce Amundson to fill the seat vacated by Councilmember Robertson, Jeff Porter, and Sara Rabb McInerny for the other vacant seats. After agreeing to waive interviews of all applicants, Council agreed to the recommended appointments unanimously. Salmon-Safe works with West Coast farmers, developers, and other environmentally innovative landowners such as cities, to reduce watershed impacts through rigorous third-party verified certification. Shoreline’s interest in Salmon-Safe came out of the Deep Green Incentive Program (DGIP) adopted in April 2017. The Certification process begins with an assessment by a multiple discipline science team. This extensive assessment results in a Gap Analysis that identifies alignment with Salmon-Safe standards as well as opportunities for improvement. If Council agrees to authorize the City Manager to commit to fulfilling two pre-conditions, the Salmon-Safe certification could follow the next month. The City would then have five years to implement the 12 conditions. Shoreline would be the first Certified City in Washington State, and the second in the country. Portland, OR is the other city. The two pre-conditions are to (1) ensure environmental regulatory compliance by signing a statement that the City is not in violation of any national, state or other environmental regulation and (2) a commitment to adhere to Salmon-Safe standards for expansion or redevelopment as related to City property. Among the 12 conditions are to apply Salmon-Safe stormwater guidelines, improve stormwater management at North Maintenance Facility, assess water conservation efforts, adopt Salmon-Safe construction standards, assess snow removal and ice control plan, and incorporate habitat and fish use information into surface water master plan. The benefits of Certification include an independent validation of the City’s environmental performance, risk reduction, on-call expert guidance, and positioning Shorelines as an environmental leader. It may also serve to make our projects more competitive for grant funding. And finally, 92% of the orca’s diet is salmon. By saving the salmon, we may save the orcas as well. Since Shoreline is already environmentally focused, what is the payoff from this Certification? There are costs involved, including added staff and equipment. It would be nice to be more competitive for funding and we would like to see improved water quality. And it’s nice to be on the cutting edge. On the other hand, we won’t be actually saving salmon but we will have a plaque on the wall. Although we should do the things outlined by Salmon-Safe, do we really need to invest the money in the non-profit? We have a number of plans and priorities, how will these new priorities fit in? Salmon-Safe should not supersede our current priorities. New costs are critical. We have so many projects to fund and five years for Salmon-Safe is a very short timeline. Staff continues to work with Salmon-Safe for flexibility in approaching this project all at once. Portland incorporated Salmon-Safe one department at a time. Randy Witt, Public Works Director, joined Miranda Redinger. Larger projects are doing this anyway. This has to do with facilities, not sidewalks More green activities around sidewalks is something we’re planning to do anyway. As we update the surface water manual, we want to go to the optimum model. Some of these things can be discussed in two to five years. Dan Kent, Executive Director of Salmon-Safe, joined the discussion by phone. The City of Portland found raising funds was helped by the Certification. Moved to an Action Item for April 22nd meeting. As a means to keep the Council informed of the financial position of the City, this detailed report summarizes the financial activities during 2018 for all City funds with itemized information provided on the General Fund, Street Fund, Surface Water Utility Fund, General Capital Fund and Roads Capital Fund. Additionally, the report includes the year end summary for the City’s Transportation Impact Fee and Park Impact Fee collections and expenditures. It is important to note that nothing from the year end fiscal performance disrupts anything planned for the 2019-2020 biennium. Utility taxes are the only negative, especially natural gas (mild winter). Cable TV is down as more people “cut the cord” and telecommunication is down possibly due to fewer land lines in favor of cell phones. These appear to be just trends and not areas of great concern. Due to delays and other unanticipated issues, some appropriations were not expended in the 2018 Budget. In order to provide adequate budget resources in the 2019-2020 biennium to pay expenditures incurred for operating programs or complete capital projects initiated in 2018, re-appropriation of a portion of the 2018 ending fund balance for expenditures in the 2019-2020 biennium, commonly referred to as a carryover, is needed. Proposed Ordinance No. 854 re-appropriates $29,929,672. Mr. Kirkwood referred to the staff report for details. There were no questions or further discussion. During the first quarter of 2019, staff identified several operating programs and capital projects that require additional funding due to unanticipated needs that were unknown in November 2018 at the time the 2019-2020 Final Biennial Budget was adopted by the City Council through Ordinance No. 841. Staff is requesting that the 2019-2020 biennial budget be amended to provide funding for these programs and projects. Proposed Ordinance No. 855 provides for this amendment. Mr. Kirkwood referred to the staff report for details. General Comment by Councilmember Roberts: what is the City doing to engage people for the 2020 Census? Ordinances 854 and 855 have been added to the April 22nd Consent Calendar. Shoreline WILL NOT be signing on to the new "Homeless Authority" to clean up the disaster which was created by the Homeless Industry Complex and Seattle's mess they made. We can't afford it. We're already losing massive tax revenue from the welfare for the wealthy apartment block property tax breaks. You already chose your way to help with "housing affordability" with this program no one wanted, except for the real estate developers. We already are opening one homeless shelter at 198th. We're doing our part. Enough is enough.